Kiki and Tarik are no ordinary couple. Perhaps we envy their natural beauty that comes from their native island, Rhodes Island. Or perhaps it's because they have fashion off to a fine art? Or perhaps because every photo they post on the social networks takes us to far-off places where we can dream, just for a while... They are affectionately envied for many reasons but there is no doubt about the fact that there's something special about them, a certain mystique. Even if you look at photos of them from every possible angle and in the finest detail, you can't quite put your finger on it. And what if their mysterious aura simply comes from the fact that they are in love, and love fashion? As summer draws to a close, SB! went to meet these lovebirds from the Greek Islands to talk about style, traveling and beauty rituals... and perhaps make summer last that little bit longer. First of all Kiki and Tarik, thank you for letting SB! interview you, it’s an honor. Could you walk us through your career path and tell our readers who you are? It’s an honor for us as well! We always love to get in touch with publications like SB! Magazine and do amazing work! We both are 22 years old and we are from Greece. We grew up in a Greek island called Rodos and we are together for 8 years now. At the age of 18, we moved to Thessaloniki to go to college. Then we started traveling the world and 2 years later we start blogging. During these two years, we have attended 3 international fashion weeks, been featured in NY Times fashion and Madame Figaro collaborated with SEPHORA and so many other things! You both look very cute in all your posts, but what is it to be a “fashion couple” nowadays? Well, the most important thing is to find the balance between the craziness of work and the time that a couple needs for themselves so their relationship stays healthy and their career runs successfully at the same time. So except for all the usual problems that every couple has, a “fashion couple” has “fashion problems” as well. It’s not the easiest thing to judge your boyfriend/girlfriend and at the same time not to let this affect your relationship. So the key is a balance. It must be difficult and sometimes very difficult, but in the end, it is so fulfilling! What does it mean to you to be a fashion blogger? Most people think that fashion bloggers just take photos and live in super expensive hotels and go shopping and traveling and just live the good life, but that’s so wrong, there’s so much behind this. We have to do marketing and PR, to organize strategies, to take pictures, to do styling and so many other things, basically it’s like one person (or in our case two) running a whole magazine. It looks and sounds very glamorous, but if you take a closer look you will see that it has got so many difficulties. But if you truly love it, it’s the best job to do! So if you can handle the pressure you can enjoy all the bling! Can you explain to our readers what’s Clossfashion? Clossfashion.com is a personal style fashion blog. 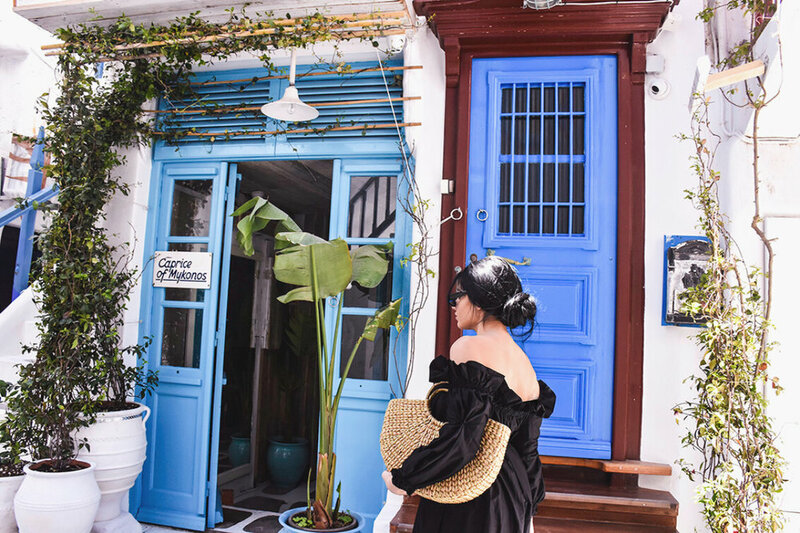 We share our trips with our readers, we share our travel style and help our readers recreate our outfits, oh and of course KIKI shares her beauty tips and secrets. We want to share only personal things and photos so we are sure that we provide our readers with only 100% quality content. Our main goal is to help our readers and always give them the best fashion and style inspiration for any part of their lives. What does fashion represent to you? We know each other for so many years and fashion is what brought us close in the first place. It was our favorite subject to discuss during our high school years. So fashion, except that is our biggest passion, also plays a leading role in what our lives have turned into, both personally and professionally. Fashion to us is above all freedom! What do you both enjoy doing when you’re not shooting stunning pictures in the Greek islands? Indeed the past few months we have been shooting in Greek islands almost every second week! So, when we don’t shoot, we love to relax and basically do nothing. After a period full of shootings and a lot of work, TV and some Chinese food is the best idea, right? We both love interior design and decoration so much, in our free time we redecorate our home. Also, Kiki loves cooking so much; she makes the best chocolate cake in the world, seriously! At the moment these are the only hobbies that we have time for. So, cooking and interior design! When we look at your website, we can read the words of a fashion enthusiast for sure, but you always remain appropriate in terms of clothing when it comes to traveling, etc. Do you think people should pay more attention to the way they dress according to where they go (rather than just putting random clothes and finding themselves restricted in their movement or overdressed)? For us, adjusting your style according to your destination is a must. For example, right now we are planning our trip to Marrakech and we are looking for a boho, oversized and airy dresses and linen shirts. We love to mix our style with our destination’s culture. Because fashion is culture, right? For example, it would be so boring for me to wear jeans and t-shirts in Positano instead of my Dolce & Gabbana inspired outfit. We are fashion bloggers; we have to give our readers a different point of view. Our followers want to be inspired, to see different looks and even some they wouldn't wear. Oh as for the “overdressed” thing, we don't believe in that we just think that everyone should wear what they feel confident in. On the other hand, we believe that during their trips people should wear outfits that help them enjoy their time and enjoy the beautiful places that they visit because they might not have the chance to go there again. Our favorite countries to visit are Greece and Italy. Greece is full of hidden gems, we love Mykonos but Greece isn't only Mykonos. We have a beach house in a tiny island called Chalki in the Dodecanese, which is literally a paradise on earth, probably this is the first time you hear about it (but if you watch our Instagram stories you may have already seen it). And Italy is our second love; this country is full of pure beauty from the Italian Riviera to Rome, Venice and Sicily. What’s the place you’ve always wanted to visit and why? We want to visit Bali desperately because we've seen all these fascinating photos in the tropical forests and we want to take some of them too. Also, a trip to Bali is very different compared to a European trip from the flight duration, the food, the sceneries and we’d love to live an experience like this. How would you describe yourselves (individually and as a couple) in three words? TARIK: Calm, dependable and upbeat. COUPLE: Creative, sociable and ambitious. Hard work pays off so never give up. Are you looking forward to taking over Sacrebleu!’s Instagram account for London Fashion Week in September? Yes, we are over excited! Can't wait to meet all the team! And of course to attend the shows with Cyril! It’s two months away but we've already started organizing our street styles! Don't miss it! Find Kiki_X_Tarik's fashion and beauty advice at CLOSSFASHION. Stay tuned for Kiki_X_Tarik's Instagram takeover during London Fashion Week from September 14th to 18th. Sacrebleu! Magazine issue 3, available in print and digital here.